Hello lovelies, today I thought I would share with you what nail polishes I have been loving and are perfect for the summer. Models Own Fuzzy peach - This is one of my favourite Model Own polishes I own, super cute coral pastel shade, I have this currently on my toes and they look adorable! Essie Fiji - If you have never heard of this nail polish shade, I'm shocked, very shocked. Its thee best natural shade I have ever tried, makes my nails look super clean but girly at the same time, sophisticated and really pretty. Nails Inc In style The tide is high - 'and I'm holdin onnnn' I love a pastel incase you couldn't tell, I adore this pastel blue, I never usually go near a blue shade but fell in love with this In Style freebie last year. 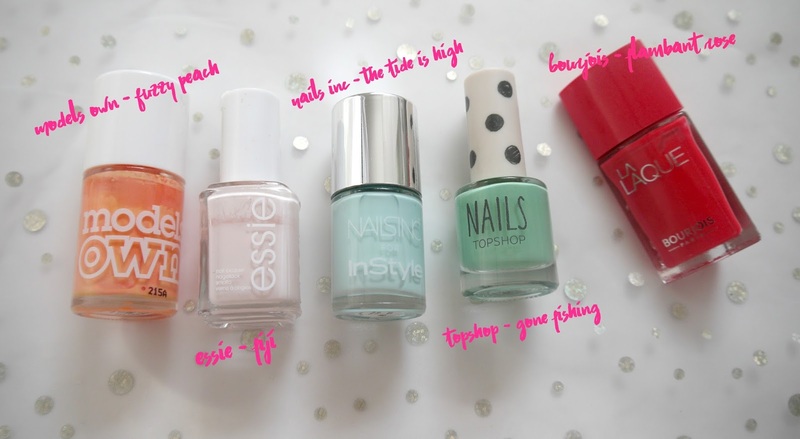 Topshop Gone fishing - To end the pastel fiasco this gorgeous mint green shade, I love topshop super cute packaging too, one coat is more than enough to be opaque and it wears quite well also. Bourjois Flambant rose - I have never been a massive fan of the Bourjois nail polishes until they brought out this new range, I adore it, lasts quite a long time on the nails depending on the nail shade, this is a gorgeous bright pink with red tones to it, I love this on my nails with matching toenails, super cute for holidays.